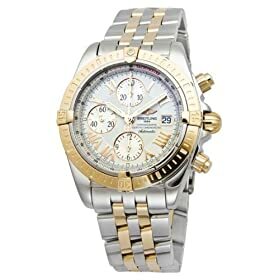 Breitling is a Switzerland-based company that designs some amazing, high-end watches. They cater especially to pilots and navigators. This Breitling Chronomat Evolution watch is a true work of art. Its bracelet is made from 18kt rose gold and stainless steel, and the watch is water resistant up to 1000 feet (300 meters). Its got a self-winding chronograph and the date shows at the 3 o’clock position. You may have heard of Breitling recently for another reason. Multi-millionaire and adventure Steve Fossett, who went missing after taking off in a plane from a remote ranch in Nevada, was said to have worn the Breitling Emergency. This watch has a feature that broadcasts a signal on the 121.5 mhz aircraft emergency frequency. Unfortunately he wasn’t wearing it on the day he went missing. If you’re a watch connoisseur, you can’t go wrong with a Breitling watch, and the Chronomat Evolution is definitely a masterpiece that will attract some eyeballs.